On 20 July 1916 the writer Robert Graves (1895-1985) was four days away from his 21st birthday when he was seriously wounded by shrapnel during an attack on the German position of High Wood on the Somme battlefield. He survived and was sent home to convalesce. He published in 1929 an account of his early life and his service in the war in his book Goodbye to All That (revised edition, Penguin, 1960/98). Here are two passages from the book from the time of his convalescence. To the man who pathetically calls himself a ‘common soldier’, may I say that we women, who demand to be heard, will tolerate no such cry as ‘Peace! Peace!’ where there is no peace. The corn that will wave over land watered by the blood of our brave lads shall testify to the future that their blood was not spilt in vain. We need no marble monuments to remind us. We only need that force of character behind all motives to see this monstrous world tragedy brought to a victorious ending. The blood of the dead and the dying, the blood of the ‘common soldier’ from his ‘slight wounds’ will not cry to us in vain. They have all done their share, and we, as women, will do ours without murmuring and without complaint. Send the Pacifists to us and we shall very soon show them, and show the world, that in our homes at least there shall be no ‘sitting at home warm and cosy in the winter, cool and “comfy” in the summer’. There is only one temperature for the women of the British race, and that is white heat. With those who disgrace their sacred trust of motherhood we have nothing in common. Our ears are not deaf to the cry that is ever ascending from the battlefield from men of flesh and blood whose indomitable courage is borne to us, so to speak, on every blast of the wind. We women pass on the human ammunition of ‘only sons’ to fill up the gaps, so that when the ‘common soldier’ looks back before going ‘over the top’ he may see the women of the British race at his heels, reliable, dependent, uncomplaining. Women are created for the purpose of giving life, and men to take it. Now we are giving it in a double sense. It’s not likely we are going to fail Tommy. We shall not flinch one iota, but when the war is over he must not grudge us, when we hear the bugle call of‘Lights out’, a brief, very brief, space of time to withdraw into our secret chambers and share, with Rachel the Silent, the lonely anguish of a bereft heart, and to look once more on the college cap, before we emerge stronger women to carry on the glorious work our men’s memories have handed down to us for now and all eternity. Towards the end of September, I stayed in Kent with a recently wounded First Battalion friend. An elder brother had been killed in the Dardanelles, and their mother kept the bedroom exactly as he had left it, with the sheets aired, the linen always freshly laundered, flowers and cigarettes by the bedside. She went around with a vague, bright religious look on her face. The first night I spent there, my friend and I sat up talking about the war until past twelve o’clock. His mother had gone to bed early, after urging us not to get too tired. The talk had excited me, and though I managed to fall asleep an hour later, I was continually awakened by sudden rapping noises, which I tried to disregard but which grew louder and louder. They seemed to come from everywhere. Soon sleep left me and I lay in a cold sweat. At nearly three o’clock, I heard a diabolic yell and a succession of laughing, sobbing shrieks that sent me flying to the door. In the passage I collided with the mother who, to my surprise, was fully dressed. ‘It’s nothing,’ she said. ‘One of the maids had hysterics. I’m so sorry you have been disturbed.’ So I went back to bed, but could not sleep again, though the noises had stopped. In the morning I told my friend: ‘I’m leaving this place. It’s worse than France.’ There were thousands of mothers like her, getting in touch with their dead sons by various spiritualistic means. 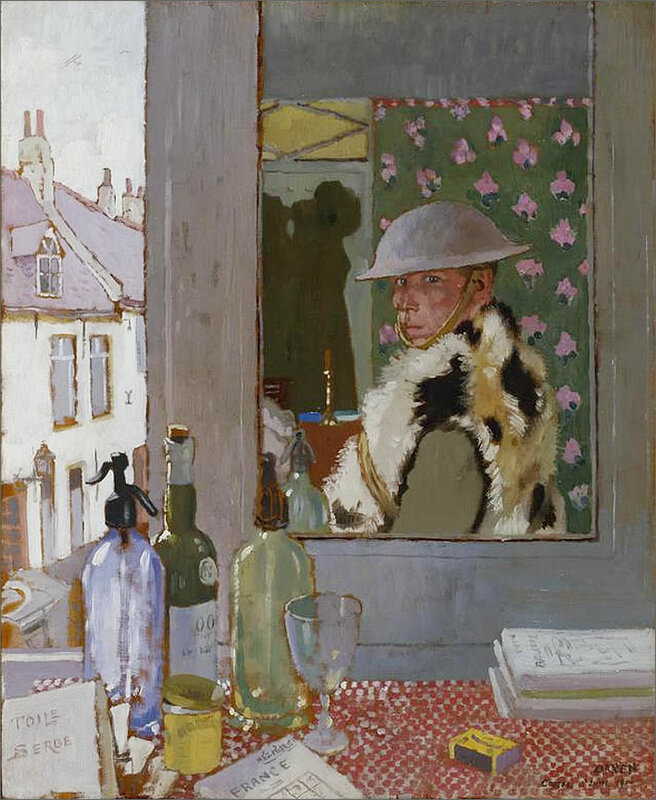 William Orpen (1878-1931), Ready To Start. Self Portrait, Cassel (near Dunkirk), 10 June 1917. Image: IWM Imperial War Museums.